On arrival at Siem Reap airport you will be greeted by our team before being transferred to your hotel to check in. You will have time to relax and freshen up after your flight before the welcome dinner. Overnight stay is at your hotel in Siem Reap. After breakfast and a good nights rest you will be transported to Mondulkiri. The trip to Mondulkiri passes through 3 provinces, Kampung Thom, Kampung Cham and Kratie province. The trip can take up to 8 hours depending on traffic and weather conditions however there will be a number of stops for lunch and refreshments along the way. On arrival in Mondulkiri province you will check into a comfortable guest house in Senmonorom for a rest before having dinner. After breakfast at the Senmonorom guest house you will depart for ethnic village of Putang. After enjoying the village atmosphere the trek begins to Roka village and its jungle waterfall. Visit a farm of the Phnong minority. Here there will be the opportunity to swim and bathe at the waterfall and enjoy lunch. The overnight accommodation will be in a home stay. There will also be a small dinner party with the indigenous people of the area. After breakfast it will be time to depart the home stay and trek through the jungle following a different path. Along the way you will gain knowledge from a guide of the local minority about the flora and fauna of the area. enjoy lunch and a swim before heading for the jungle campsite. Tonight dinner will be a BBQ and you will be sleeping in hammocks in the forest. After your night camping in the forest the waterfall is a beautiful backdrop for breakfast. The trek will then head off for another local village in the jungle on the way back to Putang village. There will be another opportunity to swim and freshen up before lunch. the trek will end around 4pm once reaching Putang village. After saying goodbye to your local guide you will be transported by vehicle back to senmonorom for dinner and your overnight stay. After breakfast it will be time for the return trip to Siem Reap. Again stopping for lunch and refreshments along the way. On arrival at Siem Reap you will be checked in to your hotel and given the opportunity to rest and freshen up before dinner. After breakfast you will be met by your guide and driver before being transported to the foot of Kulen mountain about 50 minutes from the hotel. On arrival you can stock up on water before heading off. You will be trekking through a young forest up towards the "River of a Thousand Lingas". Just under the surface of the water, carved into the river bed are thousands of lingas. Local people believe the water brings fertility and blessings to the Angkor area as the river flows from Kulen to Siem Reap. Continuing further up the mountain you will arrive at the Grand reclining Buddha. Kulen mountain remains a very sacred place where local people come to worship. A little further up the mountain is a 30m high waterfall. There is an area here where you can enjoy a swim andbreak for lunch. You will also see Srah Domrei known as the elephant pond and a bat cave which is inhabited by thousands of bats. During the afternoon you will make your way back down Kulen mountain to meet up with the driver and return to town for dinner and an overnight stay. After a hotel breakfast you will visit the city of Angkor. Firstly stopping at the South Gate of Angkor Thom and the Angkor Thom complex. You will then return to the hotel for lunch before heading off in the afternoon to the magnificent Angkor Wat temple. Angkor Wat is the largest religious monument in the world. The afternoon will be topped off by sunset at either Bakheng Mountain or Pre Rub Temple. You will then return to town where you will enjoy a fabulous Apsara dance performance and dinner. Overnight stay in Siem Reap hotel. This morning after breakfast you will visit Banteay Srei temple about 35kms out of town. This temple is very popular with tourists because of the pink sandstone used in its construction and the perfect sculptures still standing from the second half of the 10th century. On the return trip before lunch you will visit Banteay Samre temple. After a short break the afternoon will be spent visiting Tonle Sap. This huge lake is home to the amazing floating village of Chhong Khneas which you will see by boat. Returning to Siem Reap via the Artisan D'Angkor where you will witness wood and stone carving that is supported by the European Union Cooperates. You will be free to shop before returning to Siem Reap for dinner and overnight stay. After breakfast, you will meet your tour guide to accompany you to discover the Cambodian countryside by bike. This tour passes through traditional villages of wooden stilt houses with traditional Cambodian farmers. the bicycle ride is roughly 20km. Then back to the city for lunch. After lunch, you will be transferred to Golf course. A fantastic way to relax after your temple visits. After your round of golf return to the hotel for dinner and overnight stay. After breakfast at the hotel it will be time to take a vehicle to Phnom Penh. 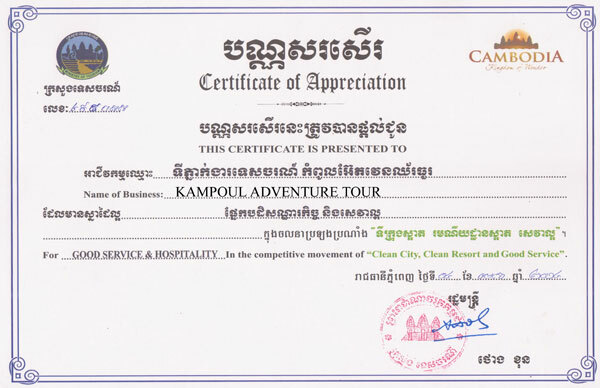 During the trip there will be stops to visit Kampong Kdei and Sambo Prei Kuk temples. Lunch and opportunities for refreshments will be provided on the trip. Once in Phnom Penh you will check into your hotel. The rest of the afternoon is at your leisure before meeting for dinner. Overnight stay in Phnom Penh. This morning after breakfast you will be visiting places of interest in downtown Phnom Penh. These include the riverside, Royal Palace and the National Museum of Cambodia. Return to the hotel for lunch before setting off to visit the Toul Sleng Museum of Genocide and the Killing Fields Memorial. Later take the opportunity to shop at Toul Tom Poung market, the central market and a number of other souvenir shops. Returning to the Phnom Penh hotel for dinner and overnight stay. Breakfast will be served at the hotel. The morning is at your leisure for any final activities before transferring to Phnom Penh International Airport for departure. If you are continuing your stay in Phnom Penh You will need to organise on going accommodation at your expense.